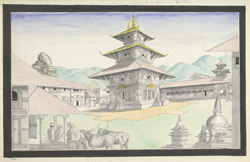 Pencil, wash and watercolour drawing of the temple and courtyard of Machhendranath (Matsyendranath) in Lalitpur (Patan), part of the Lawrence collection and created by an anonymous artist working in the Nepalese school, c. 1843-1846. This image, within a black frame, is inscribed in pencil on the front: 'No. 19. Temple of Machindi in Pâtan'; (below) 'Getta-tubaha - Dewo.' The original pencil sketch for this drawing is in the Hodgson collection in the Royal Asiatic Society (Head catalogue, 022-052). Machhendranath, the king of serpents, is a rain god who is worshipped in the pre-monsoon season in the hopes that the rains will come for the rice fields. Lalitpur, the 'City of Beauty' was founded in the 2nd century by the Kirats and it remained a valley kingdom until the late 15th century when it became a sovereign state, together with Kathmandu and Bhaktapur. All three were built around Durbar Squares containing Palace and Temple complexes. This drawing shows the Machhendranath Temple with figures and animals in the foreground.